I was going to write about the economic impact of Lent but what I really wanted to know about was the McDonald's Filet-O-Fish. You may have already picked up on my obsession with Mickey D's. I will admit it, I LOVE McDonald's, but back to the sale of fish sandwiches. In 2009 it was reported that McDonald's sells about 300 million Filet-O-Fish sandwiches annually - 25% of which are sold during the Lent season. Some Kentucky regional stores reported selling an additional 7,700 sandwiches during Lent last year. That is a lot of fish! 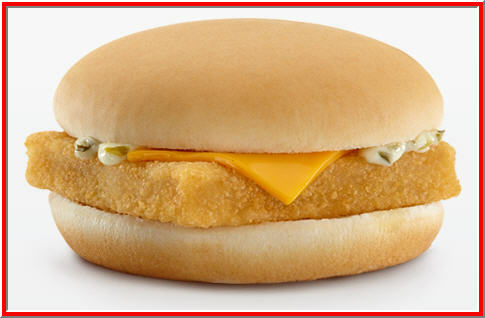 It turns out the Filet-O-Fish was invented for Fridays and for Lent. In 1962 Lou Groen was operating a McDonald's in Cincinnati, Ohio but he was about to go under because most of his customers were Roman Catholic and abstained from meat every Friday and during the 40 days of Lent. So Lou came up with the idea for a fish sandwich. He took the idea to Ray Kroc. Kroc had his own ideas for a meatless sandwich - grilled pineapple. In a head to head sales competition the fish sandwich won hands down and the rest is history. The Filet-O-Fish became the first additional to the McDonald's original menu. You may remember this catchy tune from 2009. Sorry if it stays with you the rest of the week.